Traffic Tickets Can be Fought! Let’s face it. We often are pulled over by the police for a traffic violation and then given a traffic ticket. This isn’t because we are a bad driver, rather it is a simple case of being in a rush to get somewhere, not paying attention to how fast we are going, or being distracted by someone or something. Often times the police lay in wait and trap you. This is outrageous. Unfortunately for us, traffic tickets have consequences, both financially and in real life, like a loss of driving privileges, increased insurance rates, punitive fines or jail time. Even the most minor traffic offenses can impact your driving record. If you are convicted of a moving violation, the New Jersey DMV (Division of Motor Vehicles) will add points to your record. The DMV will track the amount of points on your record and if you accumulate a certain amount, they will assess a surcharge and possibly even suspend or revoke your license. In addition, you can be sure that your insurance rates will increase as more points accumulate on your license. Many people are unaware of the actual implications of receiving points on their driving record because of a traffic ticket or violation. Individuals believe that they will simply go to court, listen to whatever the judge and prosecutor have to say, and then pay a fine. More often than not, individuals who receive traffic tickets do not believe it is necessary to hire an attorney to fight the ticket because they are not aware of the impact that points have on their record or the high fines, penalties and increases in their insurance rates. If you are concerned then you should call Fredrick P. Niemann, Esq., a NJ Traffic Violations Attorney today toll free at (855) 376-5291 or email him at fniemann@hnlawfirm.com. A member of our firm will discuss your case with you as well as the implications of any points, fines, penalties, loss of driving rights and increases to your insurance rates due to a recent traffic ticket. failure to give a proper turning signal, etc. improper passing of a school bus for example. The highest number of points for a single offense is eight, which is given for a conviction of leaving the scene of an accident where personal injury was involved. Remember this… points will only be added to your driving record for traffic offenses you are convicted of. Simply being pulled over or charged with a traffic offense will not result in any points on your record. Only after you go to court and are found guilty will the points be added. This is where an experienced New Jersey Traffic Violations attorney comes in. More often than not, an attorney is able to negotiate with the prosecutor to reduce the charge against you in exchange for your guilty plea. This means that in many cases, the points issued against you for the offense may be reduced or even eliminated in exchange for your agreement not to contest the ticket. For example, depending on the violation, an attorney may be able to have the offense reduced to an Unsafe Vehicle Operation violation, which will result in no points on your record for the first two violations. Attorneys can also challenge the merits of many traffic violations that were obtained by an improper procedure on the part of a law enforcement officer. Remember you are presumed innocent, not guilty. For this reason and other reasons, it is important to have capable legal representation by a knowledgeable New Jersey municipal court attorney by your side for all traffic violations. Even if you only receive two points on your record for a minor traffic or motor vehicle violation, you may still be impacted. The DMV (Department of Motor Vehicles) point system accumulates points on your record over the years, with three years being the typical period your record is assessed. If you receive six or more points within a three-year period, the DMV will penalize you with a motor vehicle surcharge. Twelve points will result in a suspension of your license under most circumstances. Therefore, it important to keep a record of the points you have accumulated over the years, as this can affect your decision of whether to plead guilty or fight a traffic ticket. Even if you have no prior points on your record, you can still be impacted financially if you receive points on your license due to increased insurance rates. Since New Jersey requires every driver to have auto insurance, insurance companies know they can maintain strict requirements pertaining to their insurance rates. Many companies therefore require a spotless record in order to maintain low insurances costs. This means that the slightest infraction may cause your insurance rates to rise if it results in any points on your record. It is therefore in your best interest to avoid any points whatsoever. Obtaining representation from an experienced NJ Traffic Violations attorney is the best way to ensure such an outcome. New Jersey drivers who receive a traffic ticket in another state will most likely have their in-state driving record affected. New Jersey is part of what is called the Driver License Compact, an interstate information exchanging system where participating states exchange driving information with each other. This means that if you receive points for a violation in another state that participates in the compact, the New Jersey DMV will be informed and your NJ driving record will be adjusted based on those points. The compact consists of 45 states, so this arrangement exists in the majority of states and also pertains to all motor vehicle violation information. This information is also useful to those who are licensed drivers in another state and receive a violation in New Jersey. If your state is a member of the compact, New Jersey will share the information pertaining to your motor vehicle violation and your state will adjust your driving record accordingly. It is therefore important that you address any traffic violations by hiring an experienced New Jersey Traffic Violations attorney, whether you are an in-state or out-of-state driver. In fact, New Jersey often allows an attorney to represent you in your dispute without you even attending, meaning you can hire someone to look after your best interests while remaining in your home state. Traffic violations often result in points on one’s driving record. Such point accumulation can have both financial implications and restrictions on one’s driving privileges. 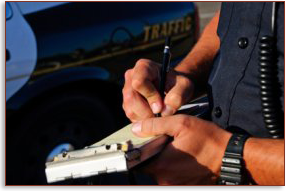 It is important to contact an experienced traffic violations attorney to discuss the implications of a traffic ticket on your driving record. Please contact Fredrick P. Niemann, Esq. today at (855) 376-5291 or by email at fniemann@hnlawfirm.com. You’ll find him easy to talk to in private, totally confidential, and a member of the office will be there for you in your NJ motor vehicle violation case.